It’s hard to be productive when your home or office is filled with needless objects. Clutter is distracting, as all the items are competing for your attention and clogging up your view. It can also make it hard to find the papers and objects you need because they get buried. 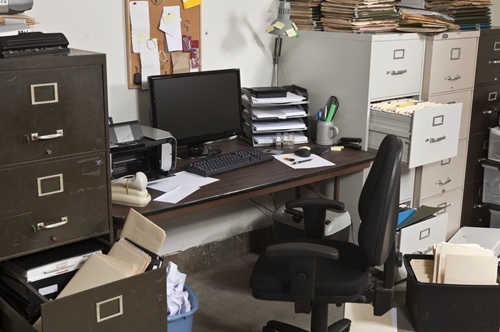 Decluttering your house or office is a big task, especially if you’ve let it get out of hand, but it’s an important step toward regaining your productivity and optimizing your workflow. Follow these steps to clear out your cluttered space, and invest in a few personalized products to keep your desk clean as a whistle. If you try to declutter with a subtractive method – taking one thing out at a time – you probably won’t get very far. Instead, take the opposite approach. Clear everything off your desk and out of any drawers. Store it all in a big box while you work. This will give you a chance to give your desk and any surface areas a thorough cleaning. When you’re finished, put a few necessary objects back – a few pens, scissors or other objects you use every day. You’ll be amazed at how much is still in the box. Sort through the objects you have left with the four-box method. You’ll need four containers or bags to section out your cluttered items – one for trash, donations, save and relocate. This method of decluttering is pretty self explanatory, but be careful with your “relocate” box. If too many things are going there, you’ll find yourself with clutter in another part of the house or office. When you’re sorting, be honest with yourself. Only keep things that you absolutely need. Donate duplicate objects and toss anything that’s broken or worn out. Once you’ve sorted through all your items, it’s time to replace the things you’ve decided to keep. A good rule when replacing your tools and papers is to organize by importance. The items you use the most should be easily accessible. If you’re always digging for paper clips, store them on top of your desk in a Round Paper Clip Dispenser. If your desk is packed with photos, invest in some Round Paper Clip Dispenser to display around the room. Store items you don’t use as often in bottom drawers or toward the back. This setup will optimize your workflow and help you to stay productive throughout the day.